Oh man, not another self indulgent, cherry picked, testimonials website page – YUCK! So why did I build one too if I feel that way? Hypocrisy aside, a lot of time and effort has, and continues to go into this little RC heli site of mine over the past 10 years now. My goal as most of my visitors & customers know, is to help others get into RC helicopters and succeed with them. When I get feedback from around the world that confirms that goal, it makes me realize that my rantings are actually helping. It's simply very rewarding knowing that others involved, or are just starting out with RC helis, enjoy this site and find the information useful, factual, and maybe even a little bit entertaining. However, the main reason why I like to post these testimonials is I feel they can offer help to someone new to, or thinking of getting into to the hobby, get many different points of view from others on the hobby in general. So, if you're the type of person who dislikes reading confirmation bias testimonials as much as I do; please read past the comments specific to me/my site, and focus on what's really important here - the reasons why we fly these egg beaters, the many varied backgrounds of us RC heli enthusiasts, and why we all obsessively love this hobby. Those are the most important, educational, and inspirational messages on this page! Thanks again to everyone who contacted me with the many words of encouragement and more importantly, sharing your passion for the hobby... it makes the effort all worth while. Hello John, Wow! Great job. I have been into RC Helis for about 3 years now, somewhat obsessively I must admit. I am very active on several forums including rcgroups.com, archeli.com.au and helifreak.com (where I am a moderator). I have learned a huge amount about all aspects of the hobby but there is always more for me to learn. I found the information on your site, relevant, clear, easy to read and follow, useful and a pleasure to browse. I have added links to your site in beginner's areas at archeli.com.au and at helifreak because I think it is an ideal starting point for folks starting out, thinking of starting out or trying to find their way through the maze of where and how to start. Congratulations on doing such a great job of sharing your passion with the wider world and the RC community. Hi John, Just some feedback here, from across the pond in the UK! I have flown several RC planes in the past, mostly as a kid with my Dad, but have always had a particular fascination with helicopters. Now I'm all grown up I've decided to take on the challenge of helis! However, having just bought a house my budget is fairly modest. Your review on the Blade 120S was excellent, and that's the chopper I've gone for, to learn something a little more challenging than my smaller toy coaxials. In fact, I've found your entire website to be incredibly useful, and refreshing to see an independent enthusiast like yourself pop up at the top of google searches. There's buckets of information at RC Helicopter Fun, from absolute beginners, like myself, to experts. I am so happy to have found this website, so I wanted to thank you. Really looking forward to flying my first hobby-grade heli. Best of luck for the future, and thanks again. Hello John - I don’t normally do this but I just had to write and compliment you on your most excellent website. I was about to give up on learning to fly r/c helis when I recently discovered your website. Over the past couple of years I've purchased and destroyed 2 Helimax Novus CP's and a Blade SR (each one not a particularly expensive bird, but...) while trying to learn how to fly. I've spent around $1000 on these birds between the original purchases and subsequent fixes. Talk about a false economy! I was at the end of my tether and about to give up when I discovered your web site. I read your articles, and then purchased most of your ebooks; the smartest thing I ever did! Your 3 step recipe to success (buy a 450, get a computer radio, tame down the settings) is golden. I subsequently purchased the Align 450 Plus RTF, tamed it down per your e-book, and I haven't looked back since. Even though this bird cost over twice the price of one of my previous ones, it would have saved me half had I been aware of your advice from the get go. I'm now having a lot of fun flying it and can't wait to get home from work each day so I can fly it some more! If only every new pilot could be given your advice, a lot of money and frustration would be saved. Your site was certainly a game changer for me - I hope your word gets out to a lot more beginner pilots before they waste money, get frustrated, and drop out of the hobby before even learning to fly. P.S. I'm currently building an Align 550E DFC which I can't wait to fly on your tamed down settings! Greetings from Sweden. Just needed to let you know that your site, and your teaching skills, in both articles on the site as well as your ebooks are great! I wouldn't even have got started without this and I'm enjoying myself immensely with my helis. I have a big house, small children, as well as a sometimes stressful job as a doctor. Helis make you forget everything around you for a while! I just wanted to take the time to thank you for the vast amount of time you put into this site. I think you have done a wonderful job providing detailed knowledge about this hobby. Just being able to learn and read about the hobby and all its various aspects has inspired me further and helped me avoid many mistakes along the way. Again I just wanted to say a massive thanks for the many of us you have aided and inspired with this site. Thanks for your great web-site with the tons of easy to understand info. I just ordered and downloaded your e-Books and look forward to learning as much as I can. Flying helicopters will be a new thing for me, and there are not to many helicopter pilots around my area. I have flown fixed wing RC for 41 years and have been a certified Airframe/Powerplant mechanic for 25 years, 5 of which have been on full-size Chinook's and Boeing/Vertol 107's for Columbia Helicopter, so I understand the complexity of these "crazy" machines and am not afraid to tinker and adjust mechanisms and linkages! Now all I have to do is learn to fly one! My primary interest is in scale just like it is for fixed wing and I hope to build a nice scale ship someday. But let's say that without any help (not even from the store vendor I bought my first heli from, because the owner isn't specialized in RC), the beginnings were not encouraging. Without any advice, it IS very difficult to fly even a beginner's heli like the Blade 120s, before you understand some basics. Then, I was lucky enough to discover your website, which enabled me to fix and understand a lot of things, especially when reading your great "Flight School" articles. So in short: THANK YOU for your huge efforts to help beginners enter this great hobby! Hi John - Quick hello and thank you for your inspiration. Your videos and explanations of this hobby are fabulous and what got me started about 2 years ago with a Blade 450 3D to start and working now on an Align T-Rex 500. I've use some of your recommendations (Glacier brand lipos & Spartan gyro), and you're spot on. Keep up the excellent work as I enjoy reading your site and watching your videos if I ever get stuck, they get me right back on track. Hey John - I'm only contacting you to say thank you for building and maintaining such an awesome site. I found your site 4 years ago soon after my wife got me a cheap co-ax from Best Buy, and it continues to be the best spot for just about anything I have a question about. I was working out of town and had to put my hobby on hold, but I've gotten back into it in the last few months and have worked my way up to nitro. Sure enough, I found exactly the answers I was looking for in your reviews and info. I was looking for a soldering iron and found your recommendation for the Aoyue, which didn't even come up when I tried searching myself, and also bought the SE helping hand. I have been interested in RC helicopters for a long time, but have never purchased one. I stumbled on your site a while ago and the wealth of information in one place was awesome. I've since purchased 3 of your e-books, and just about every question I had was answered. In a short time I'm going to make my first purchase. I just retired and I've got time to invest in this hobby. Just wanted to say thanks. Dear John, Firstly thank you for reading this. I know time is precious. Without you, I would never of succeeded learning to fly RC helicopters totally by myself! I am so proud and thankful. I am a professional Captain with British Airways - this has been a tough challenge. Crashes, " what's it doing now " conversations - why is it not working and " this is simply too hard " have now gone - for now!! I have 9 RC helicopters all Century UK products that are basically KDS - I have just purchased a 600 size machine and have 3 blade helis including the 500. Without your RC lessons I would of given up. I bought your e-books - I agree swash leveling is a tough read before bed and is still to me " voodoo magic" - however, I shall master it one day! I just wanted to say" thank you". In my early days of flying I was an instructor - it's rewarding - you are excellent. Thank you for keeping me sane, honest, and motivated by this sport and hobby. Well done john - I would like to send you a photo one day of all my machines including my scale Airwolf (it's only a 450 model and I haven't flown her yet still admire her but promise I shall !) to me your a superstar - thank you John. Hi John, I purchased two of your ebooks a while back (Setup & tips for collective pitch RC helicopters & Swashplate Setup). These books make it a lot easier than trying to continue taking notes on youtube. Know I missed some important points otherwise. Been flying for about five years and learned something new every time I read your books. I'm not into 3D stuff but like scale flying, nothing fancy nice and slow. A few figure 8's, circles and hovering (I'm a happy camper). Have a CH53 (300) and 2 (450) size birds, one is an Augusta 109 and the other a Gartt 450 Pro. Was self taught so I had a lot of crash and burns but never gave up and learned from my mistakes. Wish I had these books when I got started. I'm 70 years old and having a ball! Thanks for the great information. THANKS so much. I flew nitro RC planes over 30 years ago and always longed to try a helicopter. Your website is a Godsend. Just fantastic. I can't thank you enough for enabling me to finally reach my goal. their wait in gold. I have set up my 450 just the way you said in your eBooks and the setup made my Heli so much better to handle and control; the pitch and throttle curves work great! I also leveled my swashplate the way you instructed and if I let go of the sticks for a second or two the Heli stays still, no drifting and I don't fight the Heli. I fly the Heli, it doesn't fly me anymore. I almost gave up trying to learn how to fly one of these birds, but your eBooks and flight-school made all the difference, so thanks for taking the time to write and build this website. 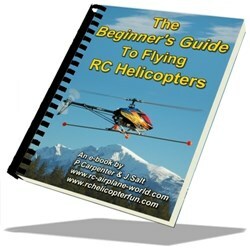 Anyone who is thinking of getting into RC helis or already has one and is feeling frustrated, I highly recommend getting your eBooks. As I said, they made all the difference in the world for me. Cheers and Happy Flying. Hi John, This message of appreciation for you and your exceptional site is long overdue. I'm sorry that I didn't send it years ago. Because of you and your instructional videos, I now enjoy - immensely - flying helicopters and planes. I can't describe how I've felt watching the helicopters and planes that I'm flying in the air. Five minutes of freedom. Like you, I have loved aviation since for as long as I can remember. Planes, helicopters, gliders. Any time I see them flying overhead, I stop to watch. I started glider pilot training while in university, but wasn't able to afford completing it. I'm 55 now... And still dream of getting a full-scale license. A number of years ago, I was buying a toy helicopter in Toys R Us for my young second cousin. On a whim, I got one for myself. After flying it, I knew that I wanted to explore more realistic and challenging models. So I went to my local RC hobby shop and they helped me pick out a Blade MCPx. Then I went online, looking for help to learn how to fly it. When I found your site and instructional videos, it was exactly what I needed. Your methodology is well thought out and explained. The progression is sensible and the videos are clear and concise. As a post-secondary teacher, I appreciated and admired your approach. I taught myself to fly a CP helicopter by following your instructional videos. To help with the nose-in stage, I got the Real-flight simulator . . And discovered planes while using it. After that, my involvement in RC helicopters and planes really took off (pun intended). I fly planes more than helis now, as planes were my first love. But I still enjoy both, so much. So, although this acknowledgement is quite a few years late, thank you very much for what you have given me. Hello Mr. Salt, I just wanted to congratulate you on your "RC Drone Misnomer" article. I've been an avid RC airplane enthusiast for years and feel the exact same way you do. Your factual article hits every point in my opinion. Why on earth all of a sudden every RC aircraft (specifically multi-rotors), have been classified as drones is beyond me. Members of my flying club are also fighting this and it's refreshing to see at least one website out there trying to educate the public instead of prey on their lack of understanding to sell something. I fear we are up against a losing battle, but perhaps if more websites and hobby shops have the insight/guts to do exactly what you have done on your website, there is some hope. I have put links on our club's website to both your article and to your website. We are an airplane only club, but after browsing your website, I found it to be a wonderful resource for all RC flying enthusiasts. Very refreshing. Keep up the good work and let's hope those "filthy drones" as you call them, days are numbered. Hi John, I just wanted to take the time to tell you how great your e-book and website are. I've been flying fixed wing for about 20 years now and have always wanted to give heli's a try. I've always been apprehensive as I've always been told it's a steep learning curve. I have a baby on the way and this summer my time will be very limited getting all of my airplane gear up to the field. I decided this winter that I was going to learn how to fly a helicopter so that I could use my 1 acre yard for flying while the baby is taking a nap. Now is a better time than ever. I purchased your e-book last Wednesday and after reading it, purchased a Blade 450 3D basic BNF the following day. I used your setup info to tame down the settings on my JR9503 radio. I followed your video tutorials, putting about 8-10 flights on each lesson. I have to say, it's only been one week and I'm flying circuits around my yard. I NEVER thought this would be possible in such a short time. Your guide and website made this all possible. I'm no expert, obviously, but I can actually put the helicopter where I want it to go, instead of reacting to it wherever IT wants to go. Hi John, this is my annual "just checking in" message! I had a wonderful time flying this year, all thanks to your training and guidance! I love that TREKKER! You are right, the bigger it is, the easier it is to fly! I'm still dreaming of a turbine some day! Thanks so much for all your guidance! Hi John, I just discovered your website and wanted to let you know how great I think it is. It is so refreshing to find a website today that is so focused on helping others out instead of making a quick buck. Sure, you sell a few ebooks and have some adverts but these are not intrusive and do not get in the way of finding the information you are looking for. I salute you. For as long as I can remember I have been fascinated by and dabbled in model aircraft, especially RC. While living in Canada in the 90s, I got involved with fixed wing RC at the local Windsor, ON flying club. Since then, I haven't had the heart to get rid of the model and gear but cannot use it where I now live in Germany. Now, in my sixties, the bug has got me again and I want to try my hand at helis. I have actually had quite a bit of fun with a "toy grade" S032 that someone bought me as a present and am ready for some proper "Hobby grade" flying, but stalled because of lack of knowledge and advice. Then I discovered your site by chance, bought your beginners guide and all has become clear. I am about to buy a Blade MSRX and will definitely get your book on setting it up and follow your flight school program. Sorry to waffle on but I can't tell you enough how much you have already helped me and will continue to help until I get to the ultimate goal of scale turbine (in my dreams!) Keep up the good work. You are very much appreciated. Hi John, You have no idea how much I (and many others) appreciate what you have done here with your site. 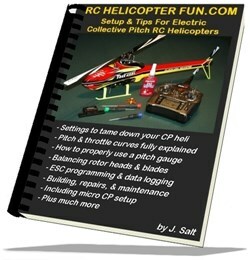 I also bought your heli set up ebook (worth every penny and then some). Anyway, just wanted to let you know that it is appreciated that there are people like you out there that willing share excellent information in what can be a very confusing hobby to get started in. Hello John, I live in Tasmania (Island off south eastern Australia), and like you, have been into model aircraft for many years. I currently have 6 helis and 4 quadcopters and like you over there, we are being bombarded all the time with the word DRONE; they have even brought out a multi-rotor magazine with such a name. It appears to be a world wide issue which is not helped with "morons" doing the wrong thing. We can only keep on trying to educate others. I have enjoyed and learned from your site many times & was thrilled to see your "RC Drone" article the other day - Thank You! Hello John, First of all I hope u had a great Christmas and have a great new year. Well, I had to sit down and write you to thank you so much for your insight and help!! The 700e DFC made her maiden flight this morning without incident!!! :-D You were 100% correct; ear to eat smile that I couldn't scrub off with Ajax!!! My girlfriend bought me a trex 250 dfc for Christmas so I worked on it first and set it up with your pitch curves, WOW, I am still amazed at how stable Align's 3GX is, then it was directly to the 700 (she bought me my batteries for it too!) This thing is amazing, super stable, and with your pitch curve for beginners and what u told me in the email I am shocked at the resolution I have in pitch control! I can fully concentrate on my cyclic control and really have a docile machine!!! Your e-books have been priceless to me, along with the advice you gave me on setting this thing up for the first flight. I just wanted to say thank you so much for taking the time to help! With all the enjoyment I have taken from this hobby so far, I hope one day I will be able to pass some of the knowledge you have shared to another beginner and repay my debt to hobbyist like yourself!! Thanks again! Hi John, Some weeks ago I was on the verge of buying a 4-port battery charging, but a friend pointed me to your article about parallel charging and as I own an 80W charger, I decided to give it a try. My parallel charging gear, complete with self-etched PCBs, turned out really nice and I am really happy with the results. I have no questions or favors to ask, I just wanted to let you know that I loved the article and that it really helped me avoid a costly mistake, i.e. buying gear I didn't actually need. Thanks a lot for your work there! John, I do appreciate all your work and all the education that you do through your website. I've always been intimidated of owning and flying an RC Helicopter, especially a 600 size. Your flight school, eBooks, and the many discussions on your website has helped me past my anxiety of flying these and let me excel in this hobby; to a point were I am now getting paid to fly them at my university where I am attending. Again, you don't know how grateful I am for you to offer your knowledge, tips, and skill for anyone basically free of charge. I have been suggesting your site, videos, and eBooks as one of the largest guides for the Aviation Department at my university to start creating a curriculum in UAVs and UASs. The reason why is because if you can take a licensed and experienced rotorcraft pilot to become a proficient RC Helicopter Pilot, I'm confident that it can be done for any type of pilot. John, this site is just amazing! Thank you so much for helping me get a good start into this new hobby. If it wouldn't be for you and this whole truckload of information I'd be pulling my hair, I swear! The guys in the store don't know a thing (at least not the simplest things I - the newbee - ask them). But that's just the way it is: One needs to be informed to make decisions. So, thanks again for all your work here!! John, I bought your setup book a while back and it has been a valuable resource. I just wanted to say again what a great site you have put together here and what a contribution the site, your books and especially the free flight school videos on youtube are to this hobby. I hope you are realizing some income from the sale of the books as the information here and in the manuals is worth far more than the prices charged. Hi John: I started this expensive RC Helicopter journey over two years ago, and it started it by me buying all your books. I emailed you with very basic questions a few times, and you were always very king to reply. Since then I have progressed, and I wish my flying had improved as much lol, but I have two Blade 450X's, two Blade 550X's and presently "learning" to build a Compass 7HV. I also have a couple of highly modified 130X's, a Blade McpX and a Blade McpX BL. This is what you started, and it is your fault. I am taking donations to fund this so called hobby. I had not been back to your site in a while, and was pleasantly surprised to see all the changes you have done to it. Maybe some day I can get to the turbine helis, since I have flown turbine airplanes for over 35 years, and the smell of kerosine is like perfume? Anyway I just wanted to say hi and thank you for creating this monster!! John, thanks so much for writing these books. I have your set up and swashplate books and found so much great information in them! I've been flying fixed wing RC since 1979 and I've tried, with little success, to fly heli's for several years only to put them on the shelf in frustration. I knew my setup was wrong but I didn't know what to do to correct it. I had no one to teach me. So, you can imagine the expense and frustration I experienced. Your books are invaluable to me. I tried starting off with Eflite's Blade coax helis and found some success with them. I progressed to their fixed pitch micro and had a little more success. I recently bought their little Nano cpX and was able to get some advice on how to tame it down. Being mostly indoor models I didn't get much opportunity to fly them outside. The Nano is my indoor baby and although I am still a long way from actually being proficient with it, I am progressing. Since I wanted something for the outdoors too I bought another Blade heli, their 300 X. I found it to be WAY too much machine for my skill level until I bought your setup book. I wanted to tell you that your tame pitch and throttle curves work great on the 300 X. I also installed training gear on it. The training gear I put on it is for a 400 and up heli, but one can still attach it without any trouble. No one makes training gear for this model. If you're not yet aware, Lynx Heli Innovations makes a great swashplate leveling indicator specifically for my 300 X and more models for other machines as well. You've been a big help with your lessons and books. I appreciate your dedication to teaching us newbies to fly helis. John, I am new to RC and bought mCX, 120SR, mSR, and mCPx in that order. I am not totally stupid as I was in charge of launch operations for the space shuttle and the ops group commander at Cape Canaveral while in the USAF and have two masters degrees. That said, I have tried for over two months to get smart about this exciting hobby and traveled hundreds of miles to the LHS in the area as I live in a small town. Well, I stumbled on to your site and decided to try your mSR and 120SR ebook and after getting that I realized I needed your beginners book and then said, hell, I need all of your books. You are an amazing technical writer that puts it in simple plain English that is usable. A+! Only after I got your ebooks did I realize how very little I knew. For example, I bought the DX6i TX and their instructions must assume that you have done this all of your life. Thanks to you, I can now effectively use my radio. You have saved me years on the learning curve and your ebooks ought to be included with every RC Heli that is sold. Thank you so much for reassuring me that this hobby just might be achievable to an old fart like me. John, I just wanted to say thank you for such a fantastic site. Almost 1 year ago, I bought an MCX2 thinking this would just be a passing phase in my life. I'm a bit of a hobby freak to be honest and I'm always looking for something more challenging, etc. I hadn't had an RC anything since the mid 80s when I had a grasshopper car/buggy. I had a lot of fun back then so I decided on a whim to get a heli. Now I have an MSRx (your book helped tremendously), real flight 6.5 sim., and most recently for father's day a 450X. I'm having a blast, so much so that my wife says I'm possessed. At any rate, I believe I owe a lot of my success thus far to you and your flight school. Having a focused program has been really good for me, and I've even practiced it in the simulator. I keep remembering your key saying, bring it home safely, in my head, and thus far have managed to do so. It's tempting to get crazy with it, but that will definitely cost you. I've only got, maybe 10 flights in a large field where I've exercised the 450x a bit in flying a large oval circuit, but I'm really having a blast. I'm still working on the nose in hover, but I'm getting there. Again, I just wanted to say thank you for creating such a fantastic flight. You've become my flight instructor, even though you don't know it, and I've told numerous people about your site. Please keep up the good work, it's helped a ton. Hi John, just wanted to thank you for basically teaching me to fly! This site is invaluable as a beginner. I brought my first heli a T-rex 450 RTF back in April this year (2013). After reading your flight school pages and using your video tutorials (which are so clearly explained and demonstrated) have gone from skidding about on the ground to entry level stunt flying in seven months.. and I've only had 6 crashes. I've modded the heli quite a bit as a result of these but each time again with the help of your site I have set it up better each time and now she runs so sweetly... now looking to get a 600E Pro DFC. Thanks for producing the best heli site out there.. keep up the good work. Hello John, I am a professional "flight-instructor and konstructeur" for "real" sport planes, helicopters and gyrocopters. I wanted to tell you that I have seen all your "videos" (Helicopter school: 1-10 ...). I know of lots of videos on YouTube BUT yours are the best! I fly as a hobby RC-Helicopter and RC-Airplanes too and I like to bring beginners into this hobby; if they still want to learn more, I say they must watch your videos. So, to make it short. Your videos, explanations and tips are absolutely top, and really much more than just amateur-Tips. Your work is professional and VERY GOOD! Keep it up... and many happy landings! John, Your e-guides a very well written and engaging, thank you for them and for the suggestion that a Blade 450 can be a good trainer heli. About three years ago I bought a HoneyBee V2 FP, it got put to one side after a very short and miserable experience. It always sat there taunting me. Time dulls the memory of failure and builds a false confidence in ability, so about three weeks ago I decide to repair it and have another go... with predictable consequences. Hi John...this is just a 'Thank you' from one who has purchased your e-books, no reply needed! I purchased a HK 450 kit and all the electrical bits (Turnigy) needed to complete it as a very cheap package, added to that a DX6i radio... This was my first computer radio and first heli build, but as I could build model aircraft I thought well, really, how hard can it be? Especially as I could fly the little Nine Eagles indoor helis... I realize now that I didn't even know enough to realize how little I knew!! The radio was a mystery, I didn't know what a swash plate was or that you needed to level it... Fortunately I found your web-site, bought a couple of your e-books and followed them to the letter. The result is that I now know exactly how the heli works and why and I hovered the bird with complete stability on the third battery! This is solely due to your instruction. Cheers mate. I just want to say THANKS, I can't tell you how much you have helped me in flying RC Helicopters. I have purchased several of your e-books and done the on=line flight school. I've gone from the Blade CX-2 to 120SR, mCP X ver 2 to the 130X (which is my favoriate right now). Again I just want to say THANKS. Hi John, I just wanted to thank you for the work you have done on your excellent website and E books. I caught the RC Heli bug one year ago now after getting myself a toy co-axial indoor model for Christmas last year, and I soon after bought a Blade mSR, Phoenix simulator and then later a 2nd hand Trex 600e. I joined a local club in March and started hovering the Trex on training gear, and I used your flight school as my guide. I also bought your beginners guide ebook and then later the setup and swashplate guides. Using these I was able to gain a real understanding of how my heli worked, and when various parts wore out was able to replace and rebuild everything following your guides. I found the format of the guides and your approach very logical and easy to follow, with a great technique of managing to explain a complex subject (for someone new to it all) in an informative and enjoyable way. I found your flight school very methodical and easy to follow, and my club mates were impressed at the rate I was improving and learning to fly. I removed the training gear after a few weeks and went on to get my BMFA A certification, which here in the UK demonstrates a basic level of safety and control of the model (hovering, lazy 8s, general safety and setup etc). A few weeks ago I did my first stall turns, loops and rolls (again following your video for inspiration), and today had quite another "milestone moment" when I attempted my first inverted hover. It was very messy and only lasted about 3 seconds, but it's a start and left me grinning like a fool! One of the things I love about this hobby is the fact you always strive for the next little goal, whether that is hovering side on, nose in, flying circuits or the first stall turn etc. Each step seems like such a hard target, yet when you reach it the feeling of achievement is amazing, and you really feel like you have progressed and can move on to try something new. Anyway, just wanted to thank you for the time and effort you must have put in to helping others in this great sport, as I certainly think my progression owes a lot to your wise words and advice. I really don't think I would have gotten this far or had this much fun without finding your website and your brilliant guide ebooks. I had to write you, I rarely ever contact anything web based. I built and flew r/c airplanes back in the late seventies and early eighties, what blast that was, especially the learning curve even back then in Futaba's early days. So, I took on the task to build a Mantis .040 size helicopter not having any clue what I was in for. This was a very tedious endeavor insomuch as the building was concerned but beyond that was that treacherous first attempt to FLY! I managed to construct extended trainer landing gear which you describe in your e-book which I purchased. I won't drag on here but instead get to the point! Thank You! for renewing a latent passion in me to reach beyond, new skills, introduction in to new and amazing technology, again what a blast. If I hadn't stumbled across your website I would have been headed for disaster. I would have bought the wrong heli, had no clue regarding the programming capabilities in order to tame the control characteristics of my Blade 450 RTF I just bought. Bottom line, I'm having a ball getting back into this, kind of like Alfie looking forward to his Red Ryder BB gun with the compass in the stock, now we have gyros! I'm going to follow your flight training tutorial because it makes sense to me. I also purchased your set up tips e-book, works for me! I now know something about what I'm about to learn, exciting for sure! I just wanted to thank you for the fantastic website! I have been slowly getting into this hobby over the last 5 years. I have not found any mentors in my area but I recently found your site and purchased one of your ebooks (on the msr/x and 120sr). I came back because I had questions about the sim I'm using and your site answered them. I'm now doing your 10 day flight school. Every time I come to your site I learn something valuable. I will definitely be buying more of your books. Please keep up the great work. There is enough material here to give me the confidence to build and fly a serious collective pitch heli. Thanks again!! Hey John, I just wanted to say how much you and your e-books have helped me with the joy of flying a rc heli. I tried back in the 80's with a GMP cobra; but with no help I failed. About two years ago I stumbled across your site, two weeks later I had a blade 400 and purchased two of your e-books. With only your videos and e-books I'm flying. I now own 3 blade 400's and a T-rex 250,450,500,550,600esp and a T-rex 700 superior. Hi John, just wanted to say thanks for the help your website has given me. I took up the hobby about a year ago & most of what I have learnt is from your website and Ebooks. Started with a Nine Eagles Coaxial, moved to a Nine Eagles Solo Pro FP, have a Blade MCPx for indoor practice & have for the last few months moved onto a 450 class CP. This was built from a kit and your Ebooks have helped me to learn to set them up perfectly. Started out with the Phoenix Simulator & have had my share of crashes with the CP, but seem to have turned a corner now. Flying most days and have not crashed for around 6 weeks now. Followed your training lessons which have been a big help. Thanks again for a top class site that has helped me get into the sport. I have also personally referred numerous people to the site. Keep up the good work. There are LOTS of training YouTube videos and "how-to" articles on RC Helicopters but nowhere have I found anything as complete as yours. I have watched your videos which are very helpful, but your articles and e-books go far and beyond expectations. The fun you’re having shows in your work and rubs off on the rest of us. I just want to pass along my thanks. I just wanted to thank you for having, as far as I can tell, the most comprehensive RC heli website on the internet. I taught myself how to fly based on the information you provided, and I have steered my friends who are getting into the hobby to your site as well. Your site is not only informative, but it is fun to read as well. Hi John, just want to say thanks again for your e books... I've been struggling for about a year with set-up; bits and bobs of info from all over the net and people's different opinions - UGH. I have followed your guides and took my heli to a club and had one of their competition pilots test it out for me as I have crashed trying to learn on a badly set up machine. One click of trim and was told it was about as perfect as it could be. WOW, now I'm buzzing. Not hard when you know how ha ha... Almost looking forward to crashing again so I can set her up again. THANK YOU. John, Today I hovered! 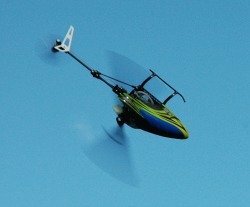 Last year I emailed you for suggestions about what I should buy as my first Heli and you suggested the Align T-Rex 600 ESP. After getting an inferior and inexpensive RTF that came with a non programmable remote I upgraded to a Hitec Aurora 9 and the T-Rex 600. Well, today I hovered for the first time. WOW, you were right. After taking my time and crawling before walking, today was the big pay-off. Hovering for the first time was so exhilarating, breathtaking, hand cramping, and all consuming. By the time my first battery was depleted, I was exhausted, and biting at the bullet to get the second battery loaded up to do it all again. I had to force myself to take a twenty minute break before getting back on the stick. Because of you and your “helpful guy at the flight field”, feeling website, I was able to reach this point. Thank you, Thank you, Thank you. Hi John, The Trex 600 flies like an absolute dream. The setup was absolutely spot on and the heli lifted off clean and hovered. The blades required no adjustment and not even a minor tweak needed from the radio. What an absolute dream in how smooth this heli is. You said it would be easier to fly if put together right than my Blade 400's and you sure where right. My wife said I had the biggest Cheshire cat grin she ever saw after the first flight. As you know I had my doubts I would ever see this through but I must admit having feelings of satisfaction and accomplishment. I can't say enough thanks to you & your e-books for the help. Thanks and more thanks John for all the help. Dear John, I began with an MSR about 12 months ago and bought your MSR ebook and loved it. 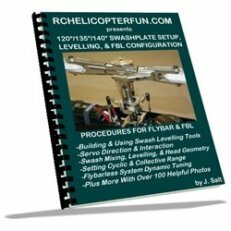 About 6 months ago I decided to take the plunge with a Blade 400, and after 5 flights and 5 major repair jobs, decided to get your heli setup and swash plate leveling books, plus follow your lesson plans. I just wanted to express my deepest thanks for the information you made available to me. I had almost given up. I now spend much more time flying than fixing and I am loving it. Thank you for teaching me to fly my helicopter! John, I just want to say how much I have enjoyed your e-books. Based on your books, I purchased a Blade 400 and was able to successfully hover it today. The flight training course on your website, including the videos, is really a huge help. Thanks for sharing your skill and knowledge with others! Hi John, I first tried to fly a big (to me) .60 powered "Shark" R/C heli back in 1976. I was 17 then. Never got it off the ground, and gave up. After seeing your site a couple of weeks ago, and your description of learning to fly, I took your advice and got a new Blade 400. I've been following your flight lessons. I am now able to hover within a 10 ft circle, about 4-6 inches high, for most of a battery pack. A little more work, and I'll start working on the forward/back/left/right stuff in lesson 4. Not one single crash so far. I really want to thank you for the help and optimism this site gives. I probably never would have taken the hobby back up if I hadn't run across your site. Thanks. John, Thanks! I was able to download the ebook. I picked up both the Blade 120 SR and the mSR over the holidays, while I rebuild my Trex 450 SE(V1). I am flying figures 8s patterns with the mSR in the basement (tame mode). You are correct - a simulator is no substitute for flying the real thing. I have four of your ebooks and found them to be very well written and informative! You reinforced some topics, clarified other topics and brought to light topics which the local hobby shop expert never discussed. Happy New Year! Hi John, Just wanted to let you know that I downloaded 2 of your E-Books and have made my decision to get the Blade 400. Guess the guys in the hobby shop will remember me. Seems I'm the only female that is interested in RC Helicopters. I am proud to say that John Salt was the person who took the time to write an excellent web page dedicated to getting people started in this fun and exciting hobby and I owe it all to YOU! I'm sure you have heard a lot of praise, but I really wonder if you know just how much your information has made this hobby all that much better, and without your help I sincerely believe that I would not have started flying RC helis! My deepest thank you and appreciation for all you do. Sincerely and CHEERS! Hi John: Just a brief note to express my thanks for your encouragement through your website and words of wisdom. I was the first to attempt flying R/C helicopters here in Trinidad & Tobago and that was back in 1979 when I purchased a Kavan Bell Jet Ranger. Needless to say that did not go well based on the lack of information and technology. The model was retired in pristine condition to this day as a static display. Tried again in 2008 with a Blade 400 and was not too successful with that either - way too fast and twitchy for this old brain and reflexes. In January 2009 I got Real Flight 4.5 and with your advice began practicing. I then bought a Raptor 50 Titan in March 2009 and began learning in earnest, again with your fine advice and with my flying buddies at the field. I have progressed continually and rewarded myself last summer with Bergen Intrepid Gasser and a Century Bell 222. Although I am not into 3D, I have progressed to the stage where I feel confident in taking delivery tomorrow of my Bergen Intrepid Turbine. Not only am I the grandfather of R/C helis here in Trinidad & Tobago, I am making more R/C history with having the first R/C Jet Turbine here. Just wanted to say thank you for helping make all this possible - I really enjoy this hobby. Thank you for taking the time and effort to put together one of the best hobby websites I have ever seen. I've already spent several hours reading and using the links on your site. It's been so enjoyable that I'll definitely be doing more of the same in the next few weeks. Your articles are well written and very informative. You have clearly put a lot to time and thought into them. You obviously enjoy your hobby and it shows in your writing. Hi John, Your information was spot on and I have now been flying for 3 months successfully including plenty of repairs and re-setting up the helicopter. I now fly confidently in circuits and limited aerobatics and have started flying a T-Rex 600ESP which is superb. I love this hobby and I wanted to thank you for being a great help in tackling the more complex aspects of it which has increased the pleasure I get from it hugely. Looking back, the ability to rebuild a helicopter consistently so that it flies the same way after a big crash/repair has been a big factor in progressing my flying skills quickly. Thank you very much! Hi John, Just wanted to let you know that even though my flybar & upper rotor didn't seem to be binding even in the slightest, I followed the directions on your website and sanded & silicon lubed the flybar ball joints & the TBE is almost completely gone. It's kind of interesting that I couldn't feel the "binding" but it was obviously there. Thanks again for all the great info on your site and for your great personal support. I know that it's not just because I'm also Canadian even though I live outside SF. :) LOL Also, I'm sure you already know this but I regularly see you and your site referenced on HeliFreak as "the best rc heli reference site on the web". Congratulations on a great job and a very helpful site. I'm ready to get back to leveling the swash plate on my Blade 400 & following your flight school with it. Thanks again. I just wanted to say thank you for all your help to me in this hobby. I have purchased your e-guide for the Blade 400 and it has helped me out tremendously and my B-400 is a much tamer ship with your suggested settings. Again, thank you John for your web-site and for sharing your knowledge in this great hobby. I have always been into aviation, especially growing up in Alaska. I used to go flying in helicopters with my buddied father who worked for Evergreen Helicopters in Anchorage. So I have always loved helicopters. In the Navy I was jet mechanic and worked and flown in A7-E Corsairs, E2-C hawkeye's, P3 Orians, F/A-18's, and my last jet the S3-B Viking. I was what they call an In Flight Tech. (IFT). My current job now is a Subject Matter Expert on the new F-35 Lighting II Joint Strike Fighter(JSF) jet. Man I love that bird and hope to get an RC of it soon. John, your website is excellent. I've been wanting to fly heli's for the last 10 years, but was discouraged by the fact that they are the most challenging of all of RC vehicles. Your website provided answers to my questions including which helicopter to buy. Anyway I did purchase a Blade 400 per your recommendation and I am so happy. I hovered today 04-10-2009. I practiced on the simulator everyday for about 3 weeks, before going out. Thanks also for your information on fixing the TBE problem with the CX3. I had just about given up and had set the helicopter aside, but after reading your information I gave it a try and "polished my balls" now it fly's great! Dear John: I have been searching the net for information about RC Heli's. Your's is by far the best I have found. Congratulations! I am 71 years old and retired. I have not flown in many years but I was an instructor for many years. (fixed wing) The advancement in the hobby is absolutely amazing. We never had electric models and I had a flight kit that weighed 40 pounds. I am interested in Heli's for three reasons. 1. I can fly in my own back yard. 2. The challenge. 3. The availability of computer driven simulators. I have purchased the RealFlight G4.5 simulator and am blown away by it. I couldn't resist flying the fixed wing models and find that I haven't lost my touch, but as you say they are different as night and day. My goal is to get as good as I possibly can on Heli's. Thanks for writing down your knowledge and I am pleased to make your acquaintance. I would like to personally thank you for taking the time to build this website. I have been fling fixed wing RC for years and have never had the nerve to take the leap into R/C Helicopters... Until I found your site. I purchased a Century 30 Hawk three days after reading over your site. And with the information that you have given me through this site I have set up and began to fly my new heli. (Tail in, Nose in hover And forward flight) AND TODAY!!!!!!! My first autorotation!!! (BUT FROM ONLY ABOUT 50FT) But hey! This is only the 10th day of me owning a RC heli! To make a long story short. THANKS! I know it has taken you a great deal of time to create this site. And the information that you have given ME is price-less! For what its worth... THANK YOU! I have given your site to some of the guys that I fly with, because they all wanted to know "How the H%LL did you learn how to fly so quick" One of them swore that there was somebody hiding in the bushes controlling my chopper! I guess the years that I flew RC planes helped a little bit because this bird flies like a plane in forward flight. Believe it or not, hovering was the hardest thing for me. But I would not have got that far if you had not been so thorough in the way you explain how to set up the heli on your site! The only regret I have is that I didn't find your site sooner! Awesome website you have here. I started flying helis not to long ago. I started out with a Blade CP-Pro all I could get it to do was a little hovering. Last week however I got myself a nice Blade 400 3D I love this heli. I'm looking forward to to using your flight training to help me get better with my 400. Anyway I just wanted to say how much of a AWESOME job you have done on your website. I stumbled across your site and thought to myself "yea, another site that hasn't been updated since 1996" Wow, was I wrong. Your site is amazing. I'm finding more information in this one place than weeks of searching previously. Thank you so much for spending the time to provide such helpful information. John, I forwarded the link of your web site to many members of my club and I have to tell you, they all are very impressed! Even experts and sponsored professional heli pilots are very impressed with the excellent information you posted. I wish I had come across this info when I started the hobby since I made so many mistakes that could have been avoided if I had read your recommendations which I agree 100% with you. Just a Quick note; Great Website, good information, straight to the point. I wish your website was around 12 months ago when I started flying RC heli's. Hello, I am very impressed with your internet site. I am new to the hobby of rc helicopters and find you advice and knowledge very useful in any way. Many congratulations on your internet site and I certainly will consult it many more times. I REALLY appreciate your site. I've been googling helis for a while as a couple friends and I are considering electric helis, and the info available is sketchy. Thank you very much for all the work you've put into this. I've learned more from your site in one hour than I have from days of internet searches! Hello John, Just wanted to thank you for such an excellent web site, I am very impressed and can see you know your stuff. I have been involved with aviation for years. I was a helicopter and Harrier pilot in the Royal Navy and then became an instructor. Now I am currently working towards my aeronautical engineering degree. My son and I have been into fixed wing RC for years and started messing around with nitro RC helicopters about 10 months ago without much success. Then my son found your web site. We took your advice and purchased the RealFlight G4 simulator and started following your 10 day lesson plan. I just can't thank you enough for sharing this information with us. In less then a month we have both learned to fly circuits and nose in hover. Keep up the excellent work! Hi John, Absolute appreciation for the site my friend! I bought a Raptor 30 a few months back and am enjoying the learning stages. Your site has helped with the learning and breaking down the amazing amount of information on rc heli's. There's a lot of info that's higgledy-piggledy across the internet and your site brings it all together in a friendly manner, easy layout, easy to understand - thanks!! Hi John, I contacted you earlier after I purchased my heli (Voyager 50) and you gave some opinions on this model. I read your segment on how to fly helis, read it again, and before I went to practice the first time, I read it again. Providing I was 10 years younger, I would have likely wanted to pop that sucker in the air and test my luck, but my added years of wisdom has taught me to "respect the advice form the experienced" and I kept replaying in my head about what you said about don't lift off the ground and if you stick to the plan you won't crash. I believe that's what has kept the heli in one piece.....the temptation is great to lift off to about 10' but these suckers are pricey to fix. With that, I say thank you for writing such a great article....I will surely contribute my success to this article. Just a quick note to say I have found your guide a great help. As a new pilot on a fp heli I was having difficulty in flying circuits ( but good at crashing circuits )But the way you explained and broke things down into segments helped greatly, everything is much smoother now,and considering I only ever want to fly scale is the way it should be. I think the furthest I'll ever want to go is a stall turn, which at my age (52)will be ample for my reflexes I suspect. I'll stay with your teachings until I reach my limits. Thanks once again, keep up the good work. Hi John, I’ve paid tribute before about how good your site is as a one-stop-shop for RC Helicopter info. I’d like to expand that by stating how good your training info is for the novice and have given this feedback (and site details) to other pilots at the airfield, after them noticing how I seemed to have a certain plan in mind while flying. A training plan is so important in order give structure to learning - so I took your plan, performed it on the simulator and then took it to the airstrip; giving me the confidence to try it out for real. It really works and saves $$$ Thanks! Hi John, Came across your site today and wanted to say you have done a great job with it and have enjoyed reading through it. I am just about to venture into heli turbines and that’s how I found your site. Hello John, I just wanted to tell you this is a great site, I have played around with some toy rc helis and just purchased a honey bee King 2. I am glad I found your site and am going to try and learn on your 10 day schedule. I am on a very limited budget but have always loved helicopters. I think its great you are willing to devote the great amount of time you do for this as most I have found are only out to make a buck. As I am new to this and learning from your guidance I will keep you posted on my progress, I just wish you lived close lol. Not much around here in the way of rc help. Thank you so much and great site!!! Hiya John, I pride myself at giving credit when, in your case, it is certainly due. There are no fancy-anything’s on your site. It is simple, your font size is nice and big, the paragraphs are not a wall of text and I actually have read everything a few times now. (And I am one helluva a zero-focus sort of guy, *laughs*) I especially like how you said not to waste time with free simulators, and guess what, I was doing just that. I am looking at the RealFlight demo now thanks to you. And it was your site that prompted me to change the servos too. Also I got a DX7! So what I am saying John is, thanks to you I just blew 800 bucks! *Joking* But yeah, I think it is important for you to know, that your simple yes ultra informative-straight-to-the-bloody-point-site might have just help my VISA bill to go over the edge and to follow my heart. You Rock! I'll take your 10 day flying lesson seriously. In fact I'll do a log for you! Hi John, I found your Web site looking for info on turbine heli basics and what a nice surprise it was, to find so much excellent and useful information on RC helis concentrated in a single place, I can only thank and congratulate you for the wonderful stuff you have here. I'm still browsing your site but already am hooked! Hi John, I have just spent a great deal of time browsing for tips from your site... May I just say that it is a fantastic site and I will be visiting again OFTEN! I have just bought my 1st RC Heli after messing around on a sim and a micro heli for 12mths. I have slight colour blindness and was told I would never fulfill my dream of becoming a Helicopter pilot when I was 10yrs old. I'm now 33, after 12yrs in the British Army where I got to fly in many Heli's and jet aircraft. It is now time to get as close to being a pilot as I possibly can. I thank you and this site for giving me more insight to flying and probably saving me money on a few spares!! Thanks again. I am hopefully about to start out in this fascinating hobby. Your website is brilliant! I am so glad I have found it! It's a very welcome source of information, for a novice especially. Know that your considerable time and effort in creating this site are much appreciated. Keep up the great work. John, Thanks for putting this web site up. After 13 years of my son and I doing fixed wing he got hooked on Heli's. After 6 months he is doing 3-D. I had to buy a 600E just to try and keep up. I have been practicing in the Sim but this site has given me valuable insight on how they work. This is a huge help. I am 61 years young and intend to master at least sport flying. Thanks again and keep up the good work.